Having trouble reading this email? Read the current and past newsletters by clicking here. Time: 8 A.M. until 10 A.M. If you are thinking of attending this special breakfast event be sure to read the listing. There are some surprises in store for those who attend. Beer and wings...what more could you ask for? Time: 11 a.m. until 11:15 a.m.
Can you say FLASH MOB?!?!?! Time: 7 P.M. until ?? for another one of them to come around. Yes, that's right, we here at the Ammo Can are dreaming of a white, snow-covered Maine. Winter does not have to mean the end of caching, however, there are some things you can do to be prepared for those chilly cache expeditions. In order to cache in the winter time, you have to join the boy scouts. Well, maybe just borrow their motto, Be Prepared! If you do your homework and have the proper gear, winter caching can be loads of fun. We Mainers do not hibernate just because the temperatures turn chilly (- 40° F) and the lawn turns white (8-foot snow drifts), and a Noreaster is on the way (a.k.a. Blizzard). We are Mainers! We get right out there and do what needs doing! And that means finding caches! In order to winter cache you first must find caches that are winter friendly. Most caches are available in winter but not all are winter friendly. Some caches might be buried under six feet of snow or frozen in place. Those would not be considered winter friendly, but does that mean you can only do guardrail caches in winter? NO! In fact, some GRC's in Maine would not be considered easy to do once the plow has pushed up ten feet of wet snow that has frozen into a large chunk of ice. So what do you do? Well, Maine has a lot to offer when it comes to winter caches. There are many caches on snowmobile trails as well as cross country ski trails. In addition, there are many that are accessible via snowshoe hikes. 99% of Maine's trail systems are open and available to some form of winter activities. Be sure you double check though, as some trail systems will allow snowshoe or cross country sking but not snowmobiling. And, don't forget those island caches. Once the lakes in the State freeze solid, you have a chance to log all those island caches that you don't have a boat to get to in the summer. Snowshoe or skate your way to that cache in the middle of Webber pond. Or, ice fish your way there! What could be more fun for the kiddos than a day of ice fishing, skating, and caching? Yes, Virginia, there is winter caching in Maine. In order to really enjoy winter caching what will you need in terms of special gear? Although you don't need a special GPS to cache in winter, you might need extra batteries. Batteries tend not to last long in extreme cold, so in addition to bringing plenty of spares with you, keep them in an inside pocket closer to your body. This will help the cold from sapping all the energy out. In addition, keep your GPS inside your jacket until you are ready to use it for the same reason. Dress well and in layers. You can always take off a layer if you are too hot but dress for success...no wait, that's for an interview....oh, yeah, dress for extreme cold no matter what the weather forecast is, then you will always be warm. Wear good warm boots designed for the snow. Sneakers may be comfortable walking in Wal*Mart in winter but not out in the woods on the trails. Wear warm hats and gloves; your mom was right, you do lose a lot of heat from your head. Not a bad idea to have extra socks in case your feet should get wet, too. Perhaps the most important item to a winter cacher...a pencil! Pens can freeze and become unusable if left in the cache so be sure to have a pencil with you. I have yet to see a Maine winter cold enough to freeze a pencil! Winter caching is fun as long as you go into it with your eyes wide open and prepared. Be a true Mainer and don't let a little cold or snowy weather keep you from participating in the hobby you love. Maybe when the weatherman predicts the first big storm of winter we need to have a flash mob event or something fun like that to show the rest of the State we won't let a little inclement weather get in our way! Cache on, Maine! Hunting season is upon us! So be sure to wear your orange hat and vest when you go into the woods caching. If you know an area is a favorite of hunters and this concerns you, you may want to postpone those caches until a Sunday when hunting is not allowed. Remember, we share the woods with all types of Mainers, and hunting is a way some Mainers have fed their families for many years. With a little care and consideration by both hunters and cachers, we can make the fall woods a pleasant place to be for everyone. Don't forget man's best caching friend either! A dog tromping through the woods can easily be mistaken for a game animal, so get some orange cloth and outfit Rover with a neckerchief. They also make full torso vests available for your pup for only about $20.00. Check your local pet stores. We here at the Ammo Can are both hunters and cachers so we can see things from both sides of the coin. Don't be afraid to be in the woods - just be there wisely and safely. Even if you are not a hunter it would be helpful for you to know the hunting seasons so you can always be prepared. If you are interested in learning more about what you can do to be safe during hunting season, go to http://www.maine.gov/ifw. And remember, hunters are not the enemy, most are just trying to put meat in the freezer and don't want to hurt anyone in the process. In the persuit of getting to know you, the Ammo Can staff recently attended the Hall Pond Hoedown, GC34WVZ, hosted by papollo & wifey which was held on October 14th. This was an event where a lot of people stopped in for a few minutes, and then continued on their way. Justkev, my mother, our two geowonder dogs (Nutmeg and Sonny) and I attended and I thought I would share a couple of photos we took. This is Hall Pond. Even on a cloudy day it's a pretty spot, isn't it? 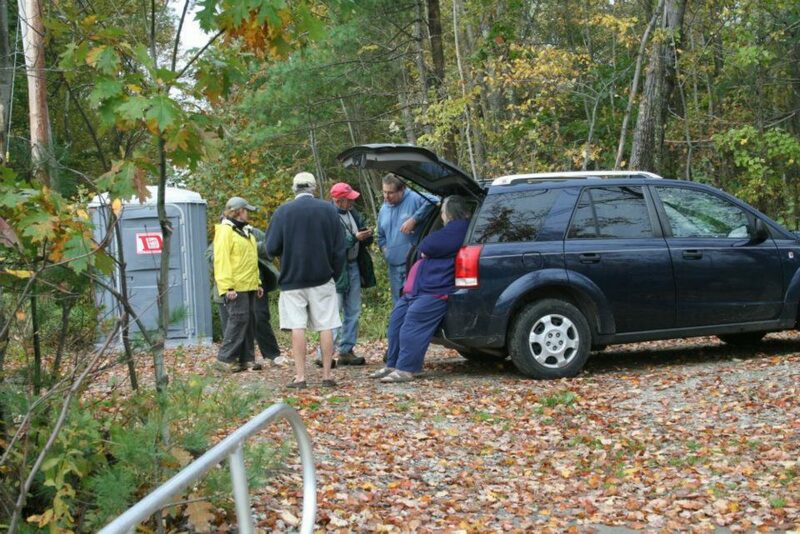 Here are just a few of the guests in attendance and our hosts talking caching and Maine in the fall. We are wondering what would make it easier for you, our loyal readers, to help us with our newsletters. 1. I had something noteworthy to submit. 2. there were some sort of incentive (like a drawing or prize) possible to win. 3. I had time for such things. 4. it were easier (please tell us what your thoughts are). 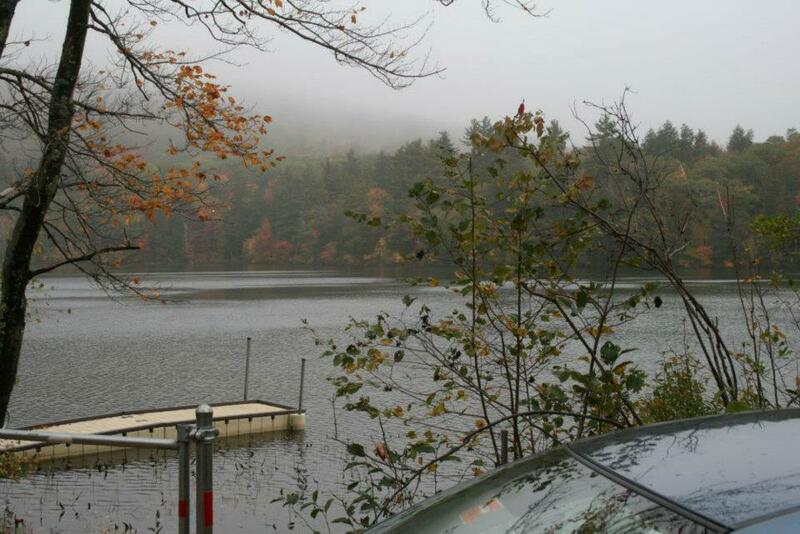 Last month we asked How many active webcam caches are there currently in Maine? The answer is only one left but there used to be two. At the time of this posting the only one left has been disabled. Let's hope one or both of them are back soon - or that a new one is placed. We here at the Ammo Can will be taking a break for the holidays, so there will be no newsletter for the month of December. We will be back in the New Year to get you ready for all the caching in 2012. From all of us at geocachingmaine.org and the Ammo Can we wish you a wonderful holiday season. Have a safe and happy, fun-filled, family-orientated, WICKED GOOD Maine time! This newsletter was sent to $username ($email), based on account registration. 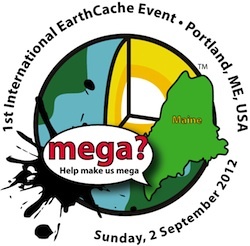 You may opt in or out of future newsletters by editing your Permission Groups in your account settings on the Geocaching Maine web site or click here. If opting in, you must also ensure the email address in your profile is valid. Your email address will not be shared with anyone.